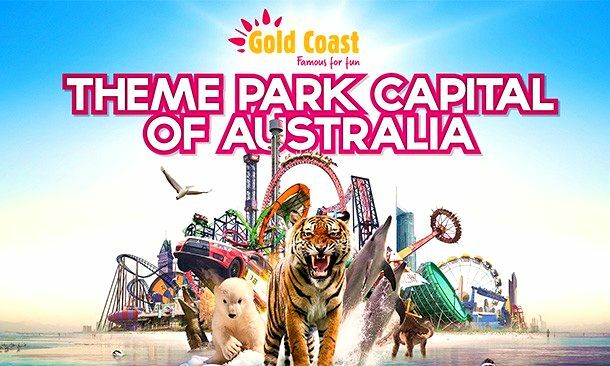 Things to do on the Gold Coast are endless; this beautiful slice of paradise is blessed with an idyllic location that is the theme park capital of Australia, boasts luscious hinterland experiences, breathtaking beaches, world class shopping, and amazing attractions. Read on to discover the best things to do on the Gold Coast. The Gold Coast is famous for many things, but at the top of the list are the golden sand shores and thundering sapphire waves of the iconic beaches. Surfers Paradise beach is internationally recognised as one of the world’s best beaches with its 3 kilometres of pristine coastline conveniently located at the end of Cavill Mall just waiting to be appreciated by visitors from near and far. One of the most visited beaches is the Super Break at Snapper Rocks in Coolangatta. This slice of Gold Coast paradise attracts one of the world’s largest surf events, the internationally attended Quiksilver Pro. It also plays host to Australia’s largest 50’s and 60’s nostalgia festival Cooly Rocks On. Burleigh Heads is a uniquely picturesque Gold Coast beach as it sits beside luscious hinterland and the dramatic edges of the Burleigh Heads National Park cliff faces. Once you’ve soaked up your limit of sunshine, you can explore the nature walks that take you all the way through to Burleigh North Beach with plenty of stunning views along the way. Both the Broadwater and further south Kirra Beach are protected and boast calm waters with little to no swell making them perfect for families with smaller children or people learning to swim. Another stunning location for calm water is Tallebudgera Creek where the meandering estuary meets the ocean. Stand up paddle boarding, kayaking, and floaties are found here in bucket loads at this popular Gold Coast beach. 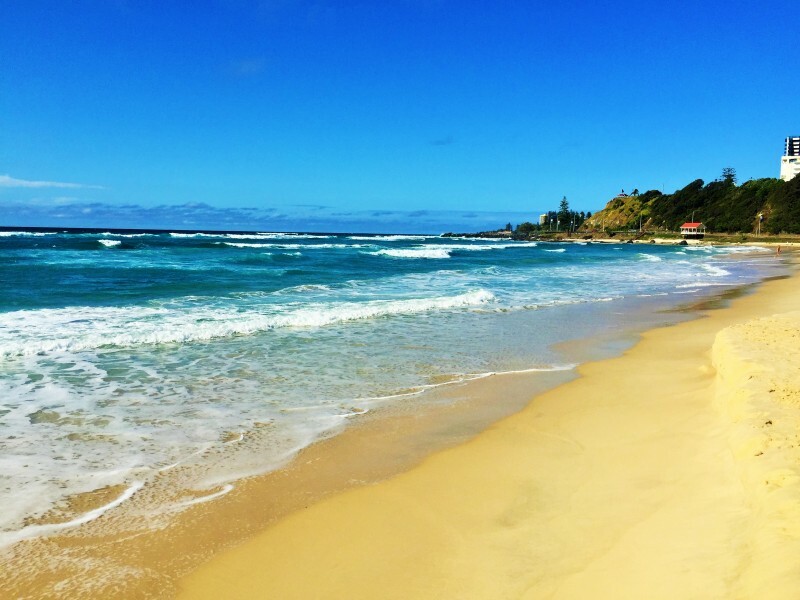 Nobbys beach is nestled between Miami and Mermaid Waters is a stunning little surf beach surrounded by quaint cafés that hosts a hipster scene. Similarly Main Beach just north of Surfers was at one point the ‘main’ beach of the Gold Coast, giving it its name. This gem also is host to Tedder Avenue a beautiful strip of cafés, restaurants, bakeries as well as boutique shopping. Broadbeach is famed for great waves, a range of fantastic restaurants when you’re done with the water as well as a world class playground – Pratten Park the Gold Coast’s first ‘all abilities’ playground filled with delights such as sand areas, spring toys, stepping blocks, a large basket swing, hill slides, sway swings, a flying fox, a huge yellow submarine, a carousel with harness, and a mermaid in the undersea zone. There are many more delightful strips of coastline on the Gold Coast, but this list should give you a good start! Theme Park capital of Australia – the Gold Coast is famous for its innovative, thrilling, and awe-inspiring theme parks. Dream World is the largest theme park in Australia and boasts family fun, thrill rides, entertainment and live shows galore. With over 50 attractions there is something to suit everyone from toddlers to teenagers, thrill seekers and more. Movie World is a fantasy land where you can meet your heroes and favourite characters, experience exhilarating thrill rides, and enjoy engaging live and recorded shows. You will find the steepest roller coaster drop in the world at Movie World, along with 4D experiences, stunt driver shows, stars parade and much more. Sea World is an experience like no other, with the creatures of the sea coming out to play alongside exciting rides, attractions, and shows. This family friendly theme park is sure to please guests of all ages with attractions for everyone from toddlers through to adults and animal encounters to please everyone. Wet ‘n’ Wild is an adventure playground boasting some of the largest rides and slides in Australia. Enjoy a splashtacular day out diving into a world of fun that is home to everything from adrenalin pumping rides to a giant wave pool, to a huge children’s aquatic playground. White Water World owned by Dream World is sure to impress with its use of cutting edge technology to create water-powered thrills for visitors of all ages. This park is home to the world’s first quadruple lane octopus racer and the nation’s biggest gurgler ‘The Rip’ as well as a host of other great rides. Australia Zoo – Crickey! This is as wild as life gets at Australia Zoo, home of the Crocodile Hunter, over 1200 animals, stacks of free shows and animal experiences. You can even get hands on with the wildlife and cuddle a koala, pat a wombat, high five a kangaroo, and hold a slithering serpent! The Gold Coast hinterland boasts a diverse array of natural wonders including tree top walks, subtropical rainforest, luscious bushland, undulating green pastures, cascading waterfalls, lakes, rock pools, swimming holes and plenty of walking trails for visitors to see the very best the Gold Coast has to offer. There are several national parks on the Gold Coast, Lamington National Park, Tamborine National Park, Burleigh Heads National Park, as well as sections within these parks that hold their individual secrets. For a bird’s eye view of the hinterland head to the Tambourine Rainforest Skywalk that guides you over one and a half kilometres of steel-structured skywalk that includes the cedar creek viewing platform and a winding ground level pathway to see the beautiful surrounds close up. Tours run daily starting at $5.50. Lamington National Park offers another heightened experience with the O’Reillys Treetop Walk – a steel cable bridge suspended 15 metres above ground made up of 9 sections totalling 180 metres was the first of its kind in Australia and still impresses visitors today with its canopy views of rainforest and native wildlife. It is also free activity with no age or height restrictions. Experience something unforgettable by taking a journey underground to discover the Tambourine Glow Worm Caves. Located at the Cedar Creek Estate this natural wonder is comprised of a cave with two main chambers linked by tunnels where you will come face to glowing face with these tiny miracles. There are also glow worm caves in the O’Reillys Plateau section of Lamington National Park that visitors can tour via O’Reillys Rainforest Retreat run tours. 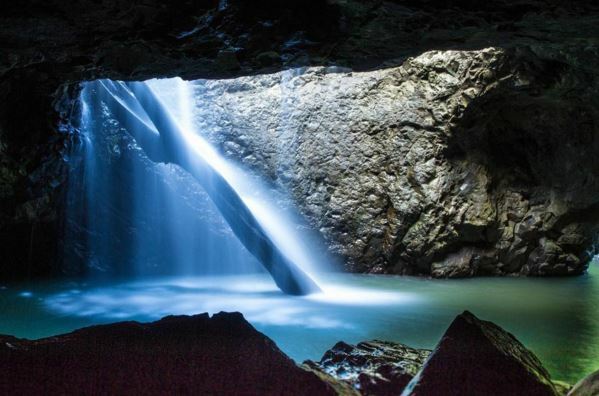 Perhaps the most famous waterfall on the Gold Coast is the Natural Arch in Springbrook National Park. This spectacular sight is actually a rock formation in a cave which the circuit allows you to view from above and below. This ‘easy’ rated walk is just 1 kilometre and also boasts buttress roots, strangler fig trees, and epiphytic ferns in the way of flora as well as pittas, rainforest dragons, and rainbow lorikeets. Other stunning waterfalls on the Gold Coast include Curtis Falls, Cedar Creek Falls, and Witches Falls in Tambourine National Park; Elabana Falls, Box Log Falls, Gwongurai and Chalahn Falls, Coomera Falls, Running Creek Falls, and Black Canyon Falls in the O’Reillys Plateau section of Lamington National Park, as well as Lipp Falls in the Binna Burra section of Lamington National Park to name just a few breathtaking sights. For a different kind of water experience head out to Cedar Creek Falls and Rock Pools or Currumbin Rock Pools – both offer a great day out to swim, relax, enjoy a picnic or meal in close by cafés. To take a hike through the beautiful hinterland with unique ocean views look no further than Burleigh Heads National Park. Located right on the beachfront, this walk takes visitors up high into the hinterland and boasts impressive views up and down the Burleigh coastline. There are also several koalas spotted regularly in this stretch of hinterland. Other beautiful walks are found in the Springbrook Plateau section of the Springbrook National Park and Green Mountains section of Lamington National Park. 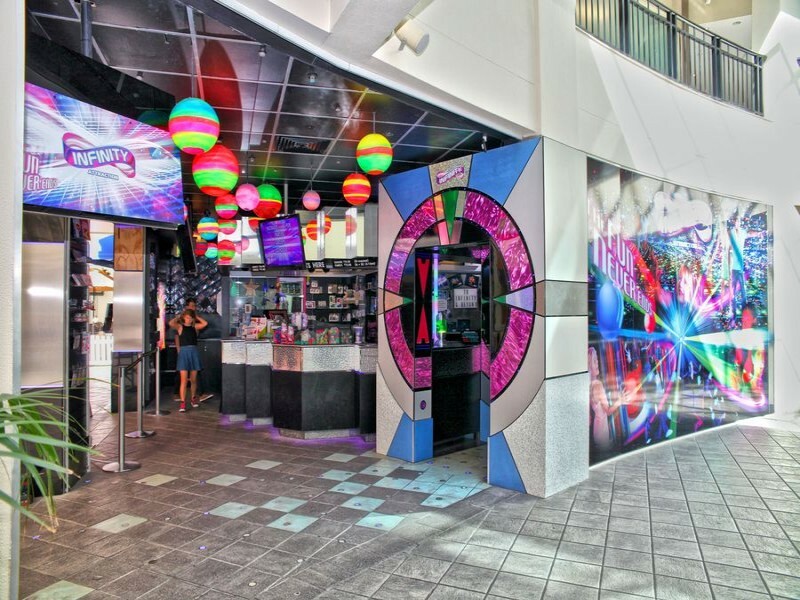 Ignite your imagination and challenge your senses at Infinity on the Gold Coast, this interactive maze takes visitors through 20 stages filled with special effects, music, aromas, and more! Once you visit it’s easy to see why Infinity is one of the most popular things to do on the Gold Coast. The aqua duck is a unique experience and iconic on the Gold Coast, your tour begins meandering through the streets of Surfers Paradise before setting sail on the water to venture towards Marina Mirage and Versace Resorts. See everything the Gold Coast has to offer in one breathtaking view on level 77 and 78 of Q1 Gold Coast from the Skypoint Observation Deck. The stunning views of the Gold Coast skyline and hinterland are unrivalled as it is Australia’s only beachside observation deck and one of the world’s largest structures. You can also pair the beautiful vistas with drinks and platters every Friday and Saturday when the deck transforms into a high altitude bar with live music. Dracula’s is a family favourite on the Gold Coast as one of the region’s best dinner and show combo’s! Dress up or simply come along for a night of spooky fun, fabulous food, and a cocktail or two. Right next door to Dracula’s is Jupiters Casino, another Gold Coast favourite for a great night out. Discover world class facilities and 24 hour entertainment with a range of activities as well as various restaurants, bars, and dance floors sprawled across the casino. A holiday favourite, retail therapy on the Gold Coast is available in abundance, from world class shopping centres to market places and street malls, the perfect outfit, souvenir for mum, or pair of shoes is waiting to be found. 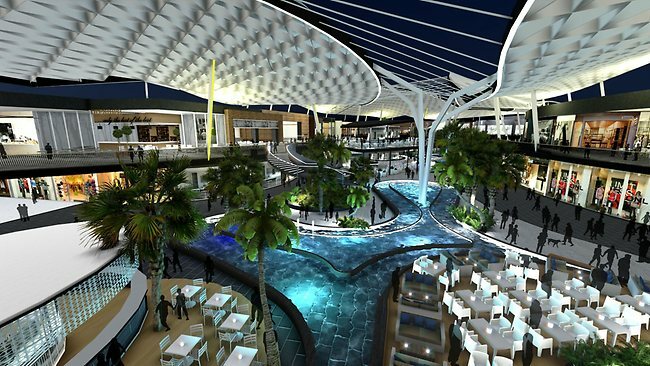 Pacific Fair is one of the largest retail districts in Queensland and upon completion of the $670 million dollar redevelopment in mid-2016 it will be one of Australia’s top five shopping centres. Over 400 specialty stores, an impressive array of dining and bar options, tropical gardens with beautiful water features, and a five star indoor/outdoor leisure and entertainment precinct await your visit. Harbour Town is the Gold Coast’s leading outlet shopping centre! If you’re idea of a great time is pairing luxury shopping for great brands at bargain prices, then look no further! Robina Town Centre is just 15 minutes from Surfers Paradise and boasts over 350 shops, boutiques, restaurants, and cafés including David Jones, Apple, Myer, Nespresso, Sass & Bide, Carla Zampatti, Seed, Sheike, and the state’s first Zara. Be entertained for hours with AMF Bowling, M9 Laser Skirmish, or VMAX Event Cinemas. Australia Fair is located in Southport in the business district and offers 210 shops just across the road from the beautiful Broadwater. Drop in for a bite to eat, movie at Birch, Carroll, and Coyle cinemas, or to satiate your retail therapy urges. In the centre of the action is Cavill Mall offering a great variety of everything from surf outlets to haute couture fashion to bargain stores and everything in between. Cavill Mall shopping is a fantastic medley of diverse shopping. Towers of Chevron Shopping Centre is a charming nook that offers several fashion and homewares boutiques as well as a great variety of restaurants and cafés. For a market experience you are spoilt for choice on the Gold Coast, of course, Australia’s largest markets are Carrara markets boasting over 400 stalls sprawled across 10 acres, have been delighting shoppers for over 30 years and offer everything from fashion to food to souvenirs and are open every Saturday and Sunday from 7am to 4pm. Surfers Paradise beachfront markets run every Wednesday, Friday, and Sunday from 3pm to 8pm and feature an assortment of premium products, including fashion, jewellery, art, photography products, beauty and homewares. The Village Heads markets grace Burleigh Heads on the first and third Sunday of the month from 8.30am to 1pm. This unique marketplace was created as an avenue for emerging designers, creators, photographers, and collectors to display their wares and talents and is now a popular hangout for visitors and locals alike. Broadbeach art and craft markets is a great day out for the whole family also on the first and third Sunday of the month and is comprised of 150 stalls of locally made craft, fresh produce, preserves, cookies and desserts, jewellery, fashion, and more. Finally Coolangatta arts and craft markets grace the southern Gold Coast shores on the second Sunday of the month with arts, craft, fresh produce, fashion, homewares, and plenty of happy customers! There are so many things to do on the Gold Coast be sure to speak to the locals at Discover Queensland on 1300 788 553 before you book your next holiday!